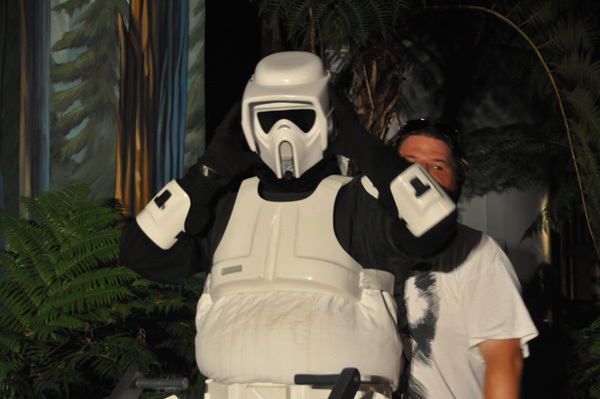 Last night I had the pleasure of attending the Last Tour to Endor event at Disney’s Hollywood Studios. 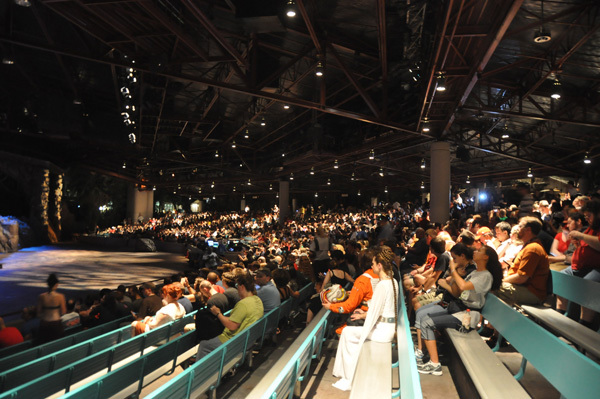 This was part of the Star Wars Celebration V that was held in Orlando August 12-15, 2010. 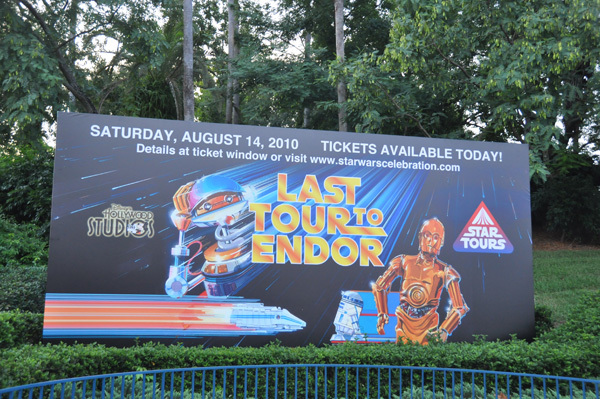 The event was one last chance to ride Star Tours before it closes for a yearlong refurbishment that begins September 8, 2010. I was amazed at how crowded the park was for this event. 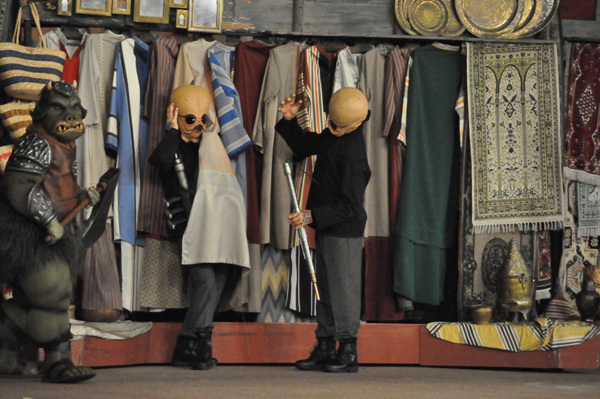 I saw so many people in elaborate costumes. 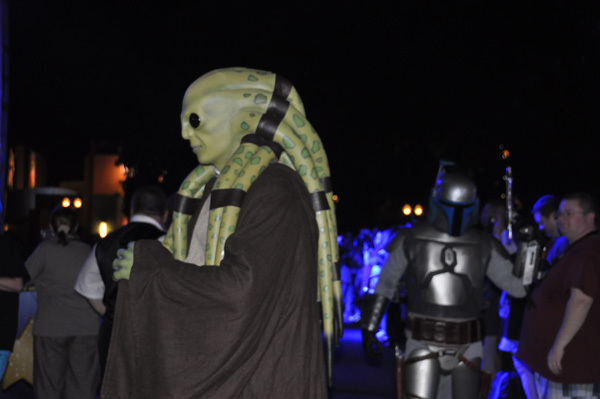 I have a new respect for those that wore costumes to the event. 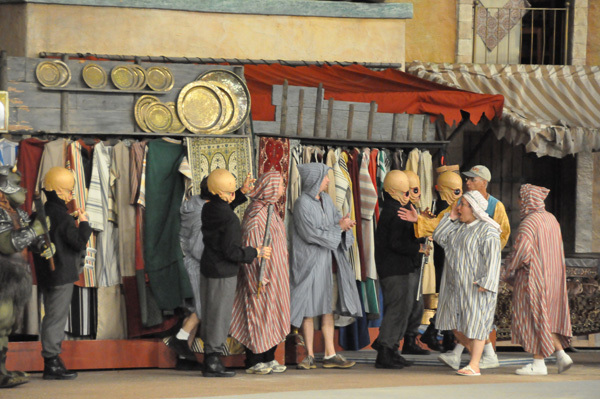 In spite of the heat they stayed in costume through the evening. We all got a wristband and were given a brochure for the festivities. 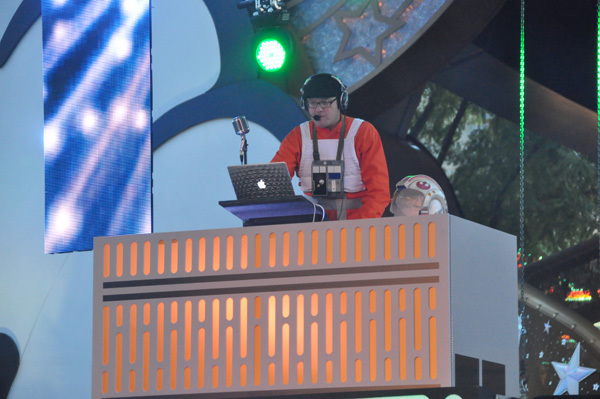 I headed for the Bespin Stage Dance Party in front of the Sorcerer’s hat. The DJ certainly had the crowd rocking. 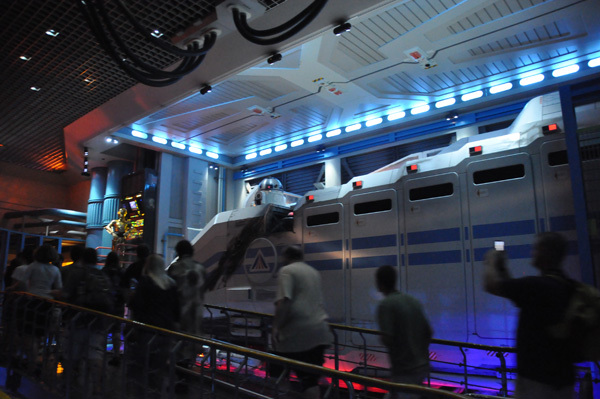 I decided before it got too crowded I would head over to enjoy Star Tours before it closed. I have always enjoyed this ride and was sad to know it would be closing at the end of the evening. I am excited for the new version coming in May 2011. I love to take pictures (if you can’t tell!) but inside the queue it was crazy. You couldn’t walk 2 feet without running into people taking pictures of the attraction. There weren’t a lot of people inside but everyone wanted their picture taken in front of the ride vehicle. There was a special feeling in the room as we took our ride. Lots of cheering and clapping as we toured the galaxy. 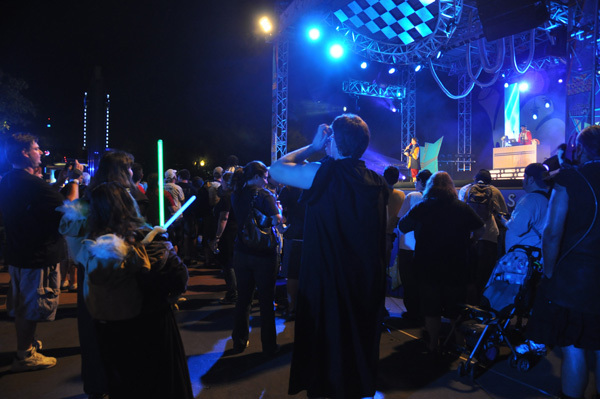 I headed back to the dance party where they were doing Star Wars trivia. I also took the opportunity to ride Toy Story Midway Mania. It was pretty much a walk on which you don’t usually see. 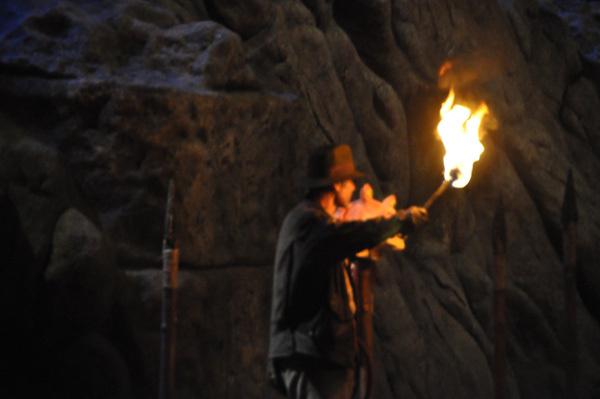 I headed over to the Indiana Jones stadium for the Raiders of the Lost Jedi Temple of Doom: A Fan Film of Epic Proportions show. I knew that it would be popular, but couldn’t believe the line of people waiting to enter. They performed the show 3 times but I wonder how many people never made it into the stadium. I know our section filled quickly. The crowd really enjoyed the show. 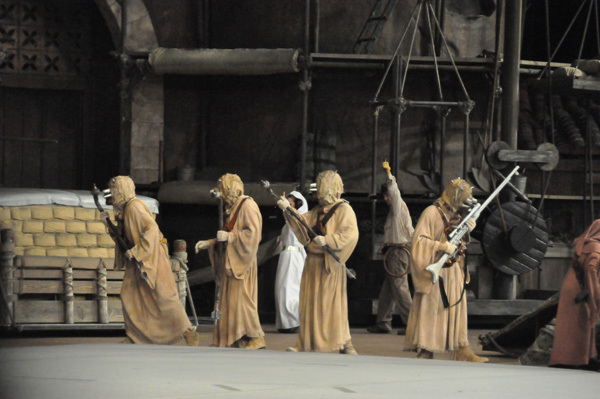 It was a mix of the Indiana Jones stunt show and Star Wars. It was a very high energy show and our show had no shortage of people that wanted to be volunteers to perform on stage. George Lucas, the creator of Star Wars was in the audience. 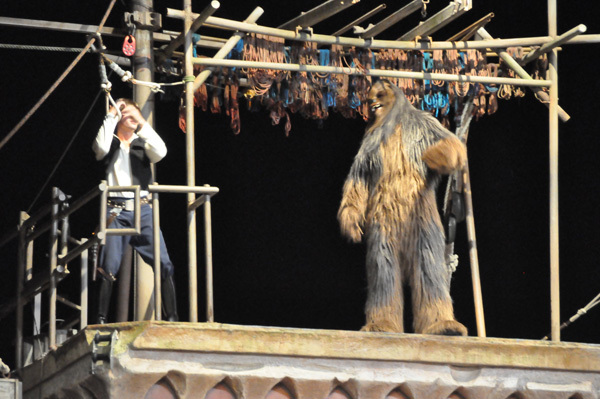 There were also several Star Wars celebrities that performed in the show. 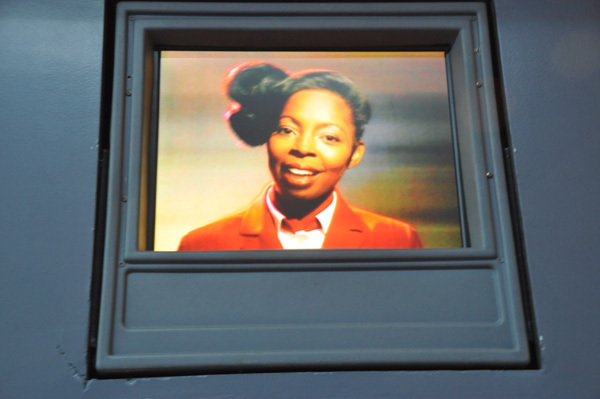 I decided to check out the Death Star Disco and do a little character sightings. 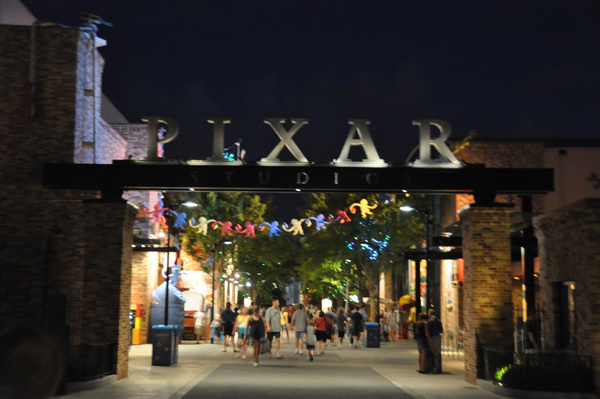 When I was there, it was Goofy and Donald Duck. There were lines of people waiting to get their pictures taken. 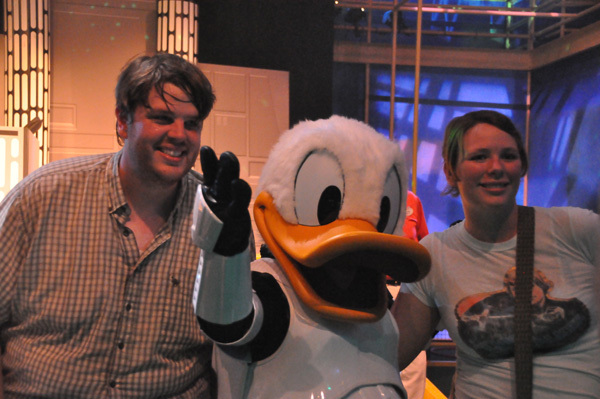 The Hyperspace Hoopla was next on my list. I was excited to be able to see it in person after seeing the You Tube video from Star Wars Weekend. It was a fun time in the crowd. 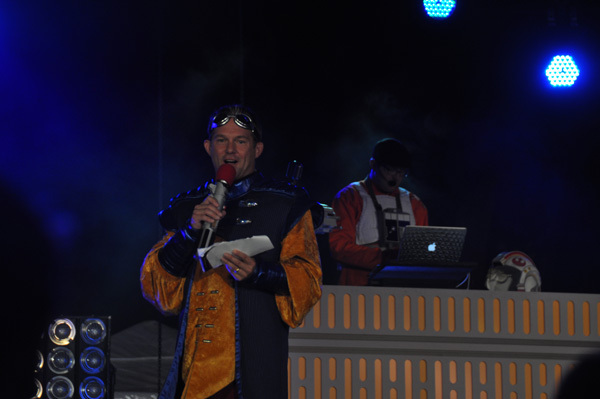 Lots of the Star Wars characters appeared on the stage and in the crowd. 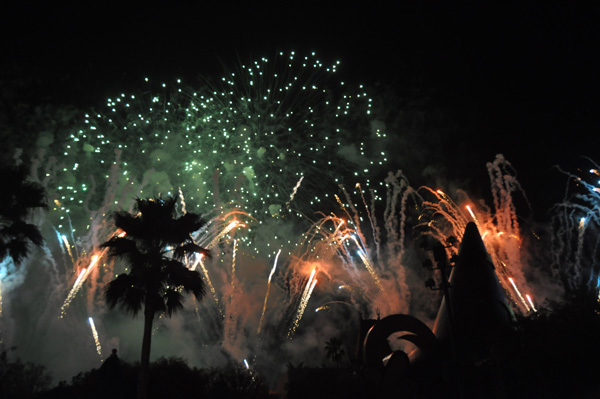 Finally it was time for the fireworks show, Symphony in the Stars Fireworks Spectacular. I was excited since Disney really knows how to do fireworks! 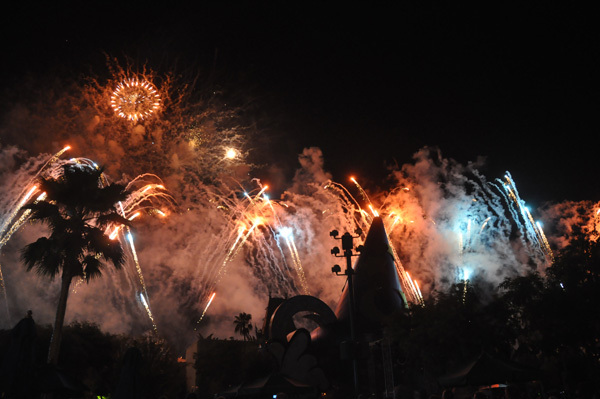 The story of Star Wars was told in the fireworks along with the music of composer John Williams. 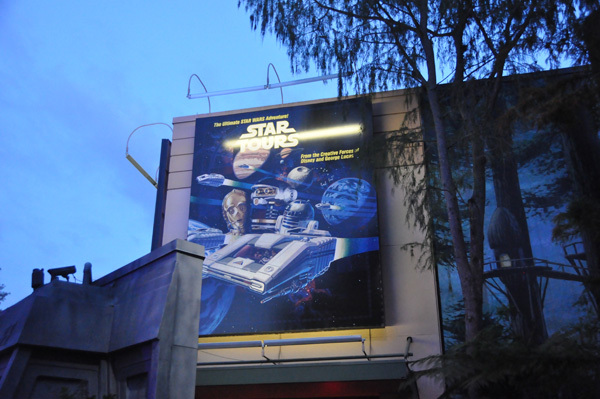 After the fireworks there was some time before the Star Tours Shutdown, so I decided to head over to ride it again. My second ride was crazy with people yelling and screaming at the screen but was so much fun! Everyone clapped as they left. 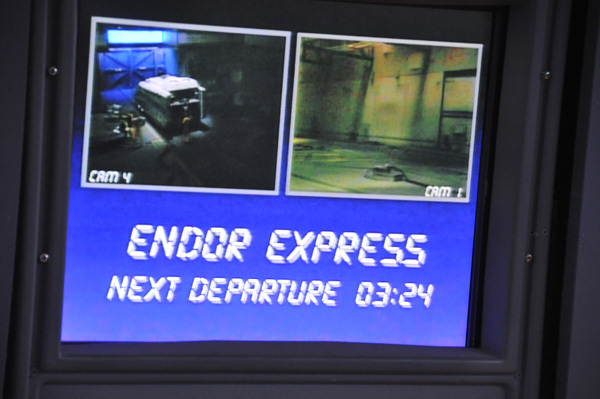 The show was delayed so I rode Star Tours again. Did you ever wonder what would happen if you took flash photography on the ride? I did. Many of the people decided that since it was shutting down they would take flash pictures. All of a sudden we heard the message that you weren’t allowed. So they do watch to see what you do while riding. 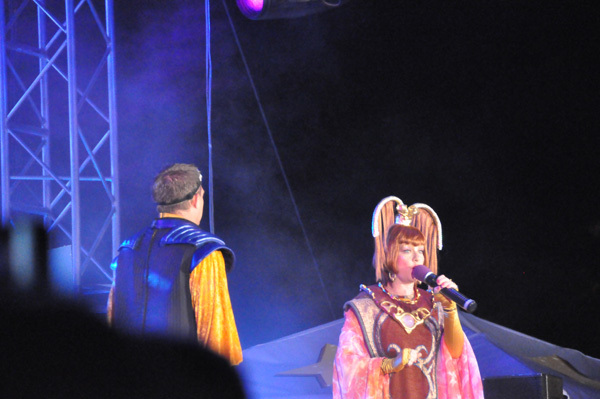 You could see that the cast members were sad that the ride was closing. 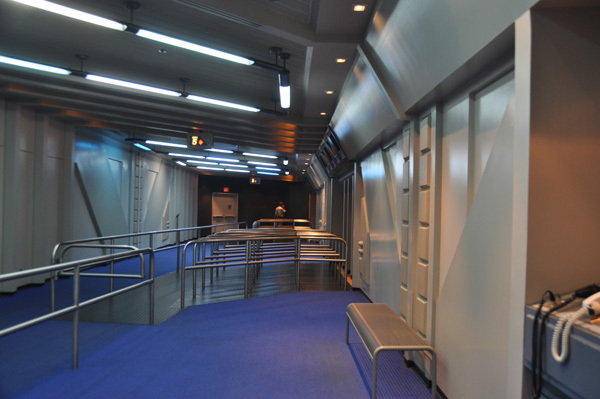 As a Disney geek, I will always remember that I was one of the last ones to ride Star Tours. Finally, after a short delay they had the Shutdown ceremony. 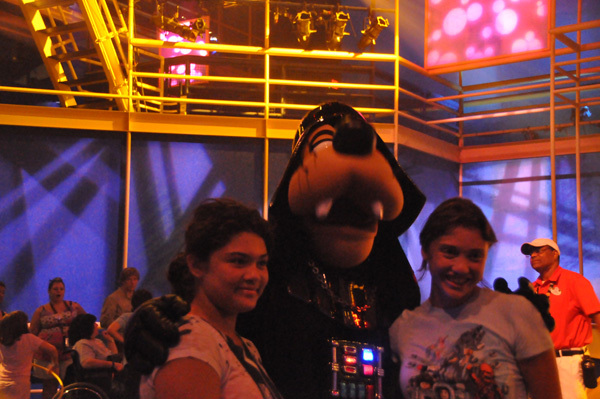 Darth Vader came out and threatened the Imagineer that they had better finish on time. The ride went out with a bang as “explosions” rocked the building. All too soon the evening was over. I will remember this event for a long time. 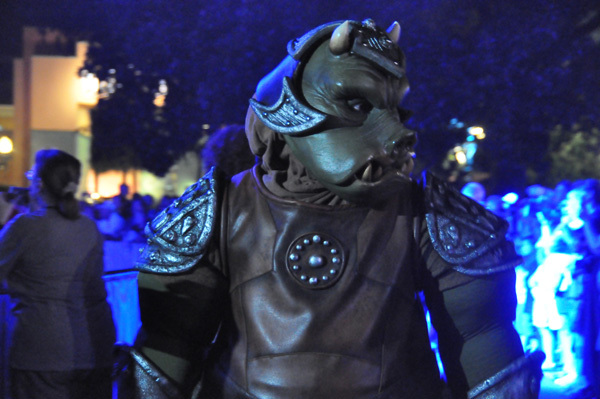 It was the perfect mix of Disney and Star Wars! Did you go? What did you think of the evening?